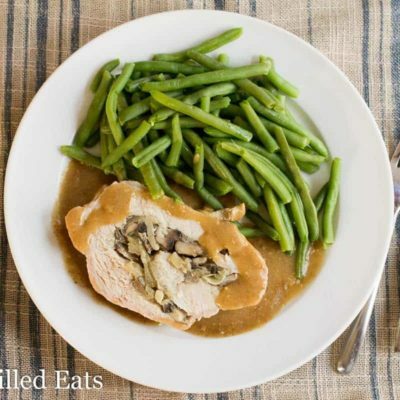 Stuffed Pork Marsala is an easy but impressive way to feed your dinner guests. 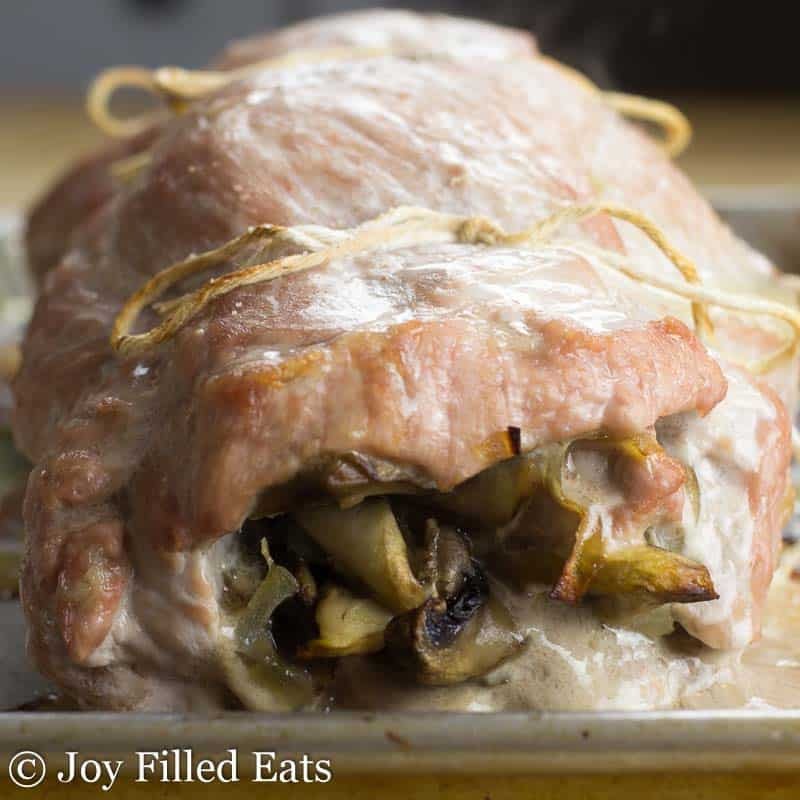 If you’ve never butterflied a pork roast and stuffed it you’ll be surprised how easy it is to make this beautiful dish. We love to have company. Almost every Saturday night we have a special meal we call Lord’s Day where we set aside that evening into Sunday as a day of rest. It is a Christian version of a seder meal. There is a short set of prayers and responses and everyone thanks God for something that happened this past week. We try to invite friends over whenever we can. My children love this special time this week, especially when some of their friends can come for dinner. I like to make something nicer than our standard dinner fare whenever possible. 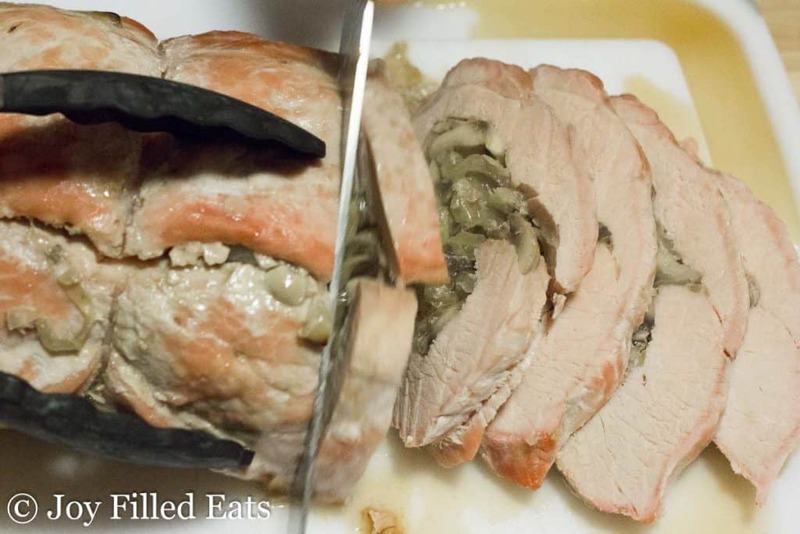 Stuffing a pork roast never ceases to impress my family and our guests. That is definitely not the point of the meal but since I enjoy cooking so much it makes me happy to feed people. That could be my Italian grandmother or Greek grandfather shining through. This can be intimidating the first time you do it but don’t worry! Butterflying a pork roast is very easy. You are basically cutting a C shape into it. For the first cut, you cut it horizontally starting 1/3 of the way down and cut it 3/4 of the way through. Then you fold that flap over. For the next cut, you cut into it from the other direction. Again you just cut, 3/4 of the way through it. What you end up with is a large flat piece of meat about 3/4-1 inch thick. After you butterfly the pork roast as shown above you fill it with some sauteed onions and mushroom, then roll it up and tie it. Since it has to cook for a while you can do this task hours before the company comes and have plenty of time to clean up and make the side dishes. My favorites are Roasted Brussels Sprouts with Garlic and Mashed Cauliflower. 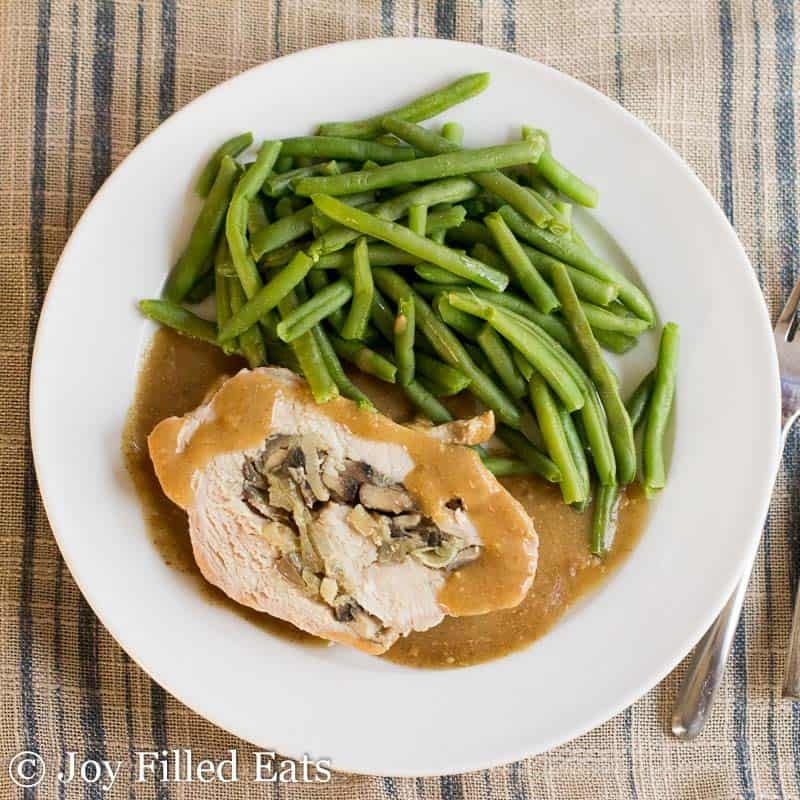 Stuffed Pork Marsala is an easy but impressive way to feed your dinner guests. If you've never butterflied a pork roast and stuffed it you'll be surprised how easy it is to make this beautiful dish. Heat the butter and olive oil in a large frying pan over medium low heat. Add the onions. Slowly caramelize the onions, stirring occasionally, for about an hour. Low and slow is the best way to get a nice caramelization. Turn the heat to medium and add the garlic and mushrooms and 1/2 tsp salt and cover the pan. Cook for an additional 5 minutes to soften the mushrooms. Meanwhile, butterfly the pork roast (***see my photos and instructions below). Sprinkle with 1/2 tsp salt. Spread the cooked filling over the pork and roll it up. Tie with cooking twine. Put onto a rimmed baking sheet and bake at 350 for 75-90 minutes or until the roast is 155 degrees when checked with a meat thermometer. Remove from the oven and cover with foil. It will come up to temp while resting. While the pork is resting make the gravy. Melt the butter in a small saucepan over medium heat. Cook the garlic for 2 minutes. Add the chicken stock, marsala wine, and any drippings from the pork. Simmer for 5 minutes. Reduce heat to low and sprinkle the xanthan gum on top. Whisk well. At this point I like to use an immersion blender to help the gravy thicken and keep it from separating. ***Butterflying a roast is very easy. You are basically cutting a C shape into it. For the first cut you cut it horizontally starting 1/3 of the way down and cut it 3/4 of the way through. Then you fold that flap over. For the next cut you cut into it from the other direction. Again you just cut 3/4 of the way through it. What you end up with is a large flat piece of meat about 3/4-1 inch thick. WHat is the best type of pork roast to buy for this ? Love this pork dish, absolutely going on the menu!!! I love having new ways to cook pork and this looks amazing! 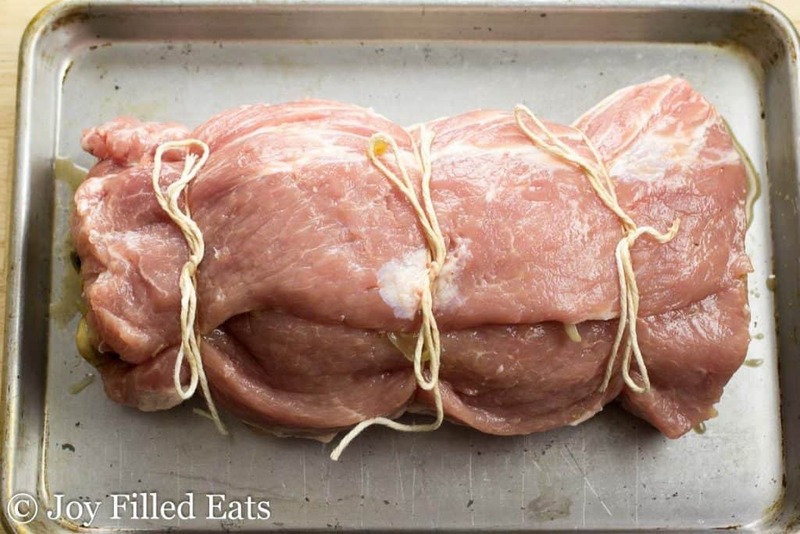 I have never thought about stuffing a pork tenderloin like this! 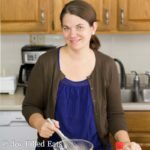 Great recipe and tips! Sometimes it's very difficult to work out whether the meat on a barbecue grill is correctly cooked, especially if it's a large joint of meat or a large bird such as a chicken or turkey. Over-cooked meat will disappoint your guests, and undercooked meat can be a health risk. I agree. 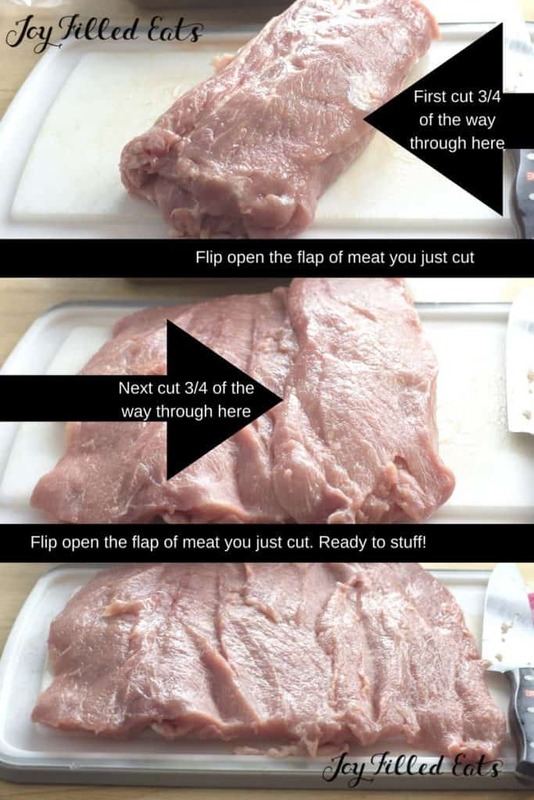 This is why I use a meat thermometer most of the time when cooking any type of meat. Is it really cooking the onions for an hour to carmelize. That seems massive amount of time. Also, cant find temp. 325? 350? Sorry, 350. I just edited it. Great idea for a healthy dinner! I love chicken marsala so I should definitely try your pork marsala! 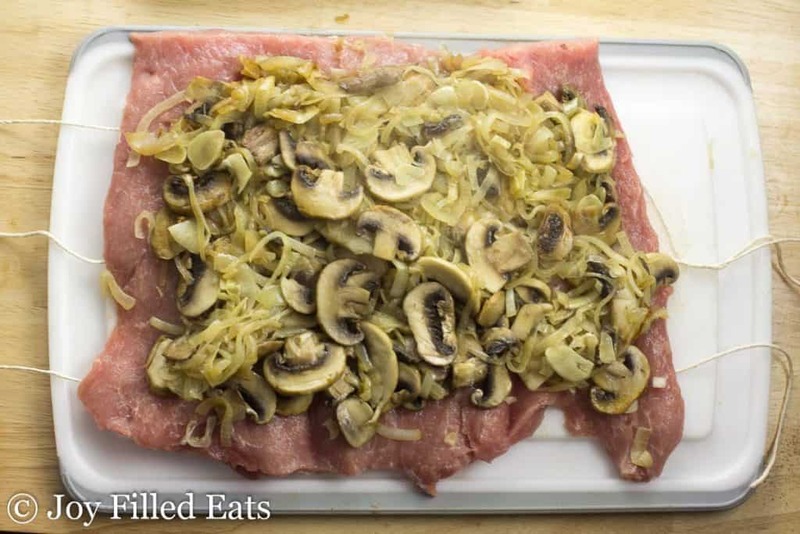 Love pork roast & stuffed with mushrooms and Marsala sauce sounds so delicious. What an impressive looking dish! This would make a great dish for a dinner party. I love a good pork roast. Stuffing it with mushrooms is awesome. Thanks. I'm always looking for new ways to cook pork - this looks great!